Before AZT I scoped every bike set up I could find. My set up ended up pretty tight and worked well for me at AZT 300 so as payback and thanks to everyone who shared theirs, here is mine. I faced some pretty big challenges with carrying capacity. My stats are 104 lbs and 5’2″. I do prefer 29ers but the wheels are so up in the frame/fork there is no room for a seat or bar bag without tire buzz. 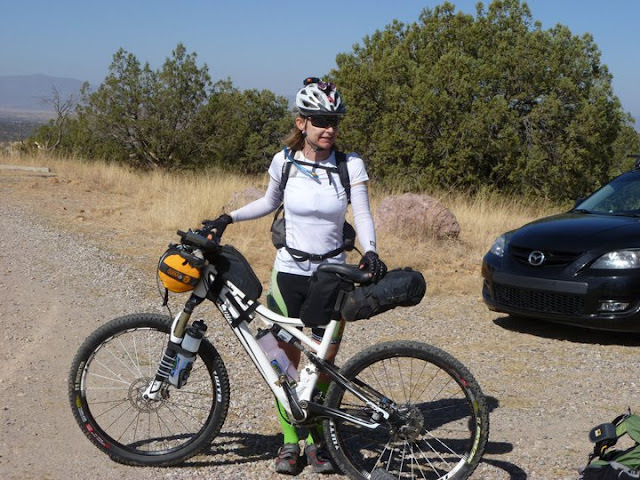 I chose a full suspension 26er bike for AZT. If I was a few inches taller it would have been a 29 for sure! Brian Blair at The Path bike shop helped me with the perfect set up and I had on board a 3 x 10 drive train with a 22×36 gear. Putting that on 26 inch wheels made for a super-duper granny gear which was key for me as it allowed me to keep riding up hills in the heat very slowly but without boiling the top off my head. It was hot out there BTW, really hot. This is when I was clean before the start. Even with my 26″ bike there is limited rear seat to wheel clearance and I could only get a medium sized seat bag in there without rear tire buzz when the suspension compressed. The main triangle is too small for a frame bag that is useful. I did have one, it was small and awkward shaped and I ditched it. In my main triangle I carried one 29 oz water bottle and two slime tubes tightly wrapped in Tyvek to protect them from spikey desert things. Held on of course by Gorilla Tape. Fluids: One 29 oz water bottle zip tied and velcroed to each fork leg, one 29 oz bottle in my main triangle, 100 oz bladder in my pack and space in my pack to pick up a big bottle of soda at the gas stations. A regular top tube tank sits behind my stem, a custom made by Relevate Designs bag sits in front of my seatpost and a compression drybag on my bars. On my back a women’s sized (meaning shorter and wider) Solomon Raid Revo 20 pack. Handlebar bag: Sleeping bag, neoair pad, bivy, emergency blanket, ear plugs, Teko socks. Sleeping comfy was on the plan! Seat bag: Spare chammy, another pair of spare socks (I thought the heat/sweat would swell/damage feet so wanted several sock options), underwear, running shorts, waterproof pants, Craft Zero long sleeve, puffy jacket, thermal knee warmers, thermal arm warmers, bra, warm gloves, buff, thermal hat, cycling jersey (which I never used). Front top tube bag: Ride food, lots of it. Seatpost bag: Tools (pliers, multi tool, levers, pump). Spares (brake pads, der hangar, cleat bolts, zip ties, tire plugs, patches and glue, quick link, tire boots, gorilla tape, lube, rag). I didn’t have a spare cable and near the end my rear der cable was frayed and hanging on by only a few threads. I stopped shifting it at about mile 200 to save it. Batteries for GPS and for lights. More ride food. I could cram a lot in this little bag! Lights: http://www.ayup-lights.com/ on head and bars with a total of 42 hours of runtime battery juice on board. No skimping here!! I was ready to be nocturnal. Backpack: 100 oz bladder, more food, sometimes a big bottle of coke, a big tube SPF 100+ sunscreen I used liberally, chammy cream, lip stuff, wispa toothbrush, toilet paper, tampons (yes my friends these were needed the whole time…), trash bag, printed maps of the course, moleskin, wipes, 3M tape, water filter, chlorine dioxide tablets, matches, waterproof jacket. I think that is it. I probably forgot somethings as it seemed I had an overwhelming number of little bits and pieces with me. Actually that’s a very very impressive set up—you covered all the bases—thanks for sharing!! Thanks for sharing, Lynda! How do you like the X-Alps? I have the same shoes and really like them. Just a question on your tires: Looks like WTBs… Nano-Raptors? Can’t see in the pic. Great ride Lynda, and thanks for sharing your setup! Some cool items there that might have come handy during my super slow ride last year… The tyre plugs look useful, might have to investigate if you can get them over here. One quick question – were you worried about the neoair puncturing? There were so many spiky things wherever I camped out I was paranoid about it going, and ended up adding a v thin sleeping pad under it. But then nothing is that spiky over here, so I may have just been worrying unneccessarily. I guess my extra weight probably wouldn’t help either! Tires WTB’s front Wolverine 2.2 and rear Mutano 2.2. I started with about 1 mile in both tires and at the finish DH said my rear tire looked like it had been raped! I love Nano’s but they wouldn’t have survived AZT. OMITN – My Neoair was a comfort item, not crucial. I wasn’t that worried about it flatting. I did check the area for cacti before I put it down. I didn’t have anything below it to protect it. I wasn’t that careful with it so I got lucky it stayed full. 42hrs battery runtime at what lumen / brightness output? How much did your batteries weigh? Do you know the combined weight of your bike and gear? I just finished up a trip with bike/gear weighing in at 50 lbs., and I’m curious what other people are hauling around. Light 58g, 480 lumens on hi. About 380 lumens on low. 6 hr (on low) battery 72g, 12 hr (on low) battery 140g. I took 3 x 6 hour batteries and 2 x 12 hour batteries so had 496g of batteries with me and two lights, so a total system weight of 612g. wpeterg – I didn’t weigh everything I hauled together. Thanks for the reply Lynda. Now debating whether to ditch the mat or the neoair for an AZT300 ITT I hope to attempt in November this year! Awesome write up Lynda! What bivy did you use? The main question, what if anything, would you not bring out of what you packed, if you were to do it over again? That seems like a lot for three days, but then I’ve always sort of roughed it when camping, and not been comfy 100% of the time. Could you go into more detail about the cages on the front forks and their attachment, ie., are the cages plastic? Did you pad the forks so that the zip ties had better grip or did you just zip tie to forks directly? Any other info on how it worked/what you would do different would be greatly appreciated. Steve – I cut up a strip of old inner tube and using gorilla tape I attached it to my fork. Then I used 6 zip ties to attach a cheap Specialized plastic water bottle cage to the fork leg over the inner tube/gorilla tape. I chose the plastic cage as it sat flush on the fork leg due to a wider contact footprint on the fork leg than any of my metal cages and it didn’t wiggle once cinched down. Once the bottle was in the cage I cinched up a Velcro strap around the bottle, bottle cage and fork leg. I will set it up exactly the same next time. It was a bomber set up. It didn’t budge over the 300 mile race.